A toaster should be used exclusively for pareve bread. The toast may be eaten with meat or dairy. Dairy and meat items must be placed in the refrigerator in a way that they will not spill on each other. If this is not possible then they should be placed on different shelves, or one should keep all items covered in the refrigerator. A hot pot should not be put on a refrigerator shelf that is dirty or has liquid from a food of a different status. It is very advisable to have two separate sinks for dairy and meat, as this prevents many potential problems. One who only has one sink should try not to place any utensils directly in the sink. Rather than washing dishes while holding them in the hand, one can place them in a plastic basin. In any case one should maintain separate sponges or steel wool. Below, we list some common kitchen items and their kosher status. A blender uses sharp blades to grind food; therefore, it should be used exclusively for either pareve, dairy or meat. One could use the blender for all pareve ingredients such as vegetables and then add the dairy or meat ingredients in a different utensil. Dairy or meat food should not be stored in a breadbox, since it may touch the bread and render it meat or dairy. The same is true about placing bread or other pastries near the vent on top of the oven. The steam that emanates from it will change the status of the bread. A pareve can opener may be used for both dairy and other kind of foods if it is cleaned very well beforehand. Separate cleaning utensils are required for both meat and dairy dishes. This applies even if one is using soap. There is a time-honored custom in klal yisroel to only use kosher soap for washing dishes. In addition, one should make sure to have separate dish towels for both meat and dairy. This applies to dish towels which are used for cleaning dirty counter tops as well. It is a good idea to have different colored dish towels to avoid confusion. Many women do not have separate pots for fish and meat. There can be a problem, however, if one cooks fish in a meat pot or meat in a fish pot that was used with heat within twenty-four hours. Most poskim say that the food is permitted if the pot was washed out well. Some poskim suggest maintaining a separate fish pot to obviate this question. Separate utensils are not required for both meat and fish. Some say that one should wash a fork before switching from fish to meat. Since a food processor is a knife, if it is used with hot meat, or cold meat with onions, it is rendered a meat utensil. A grater is considered like a knife, so the flavor of a sharp food grated on it will render the grater into either dairy or meat. Therefore, it is important to have separate graters for dairy and meat. Food served on a high-chair for a child is not yad soledes bo [Ed. Note: the temperature which can affect thte status of utensils]. Therefore, there is no reason to have separate trays for both dairy and meat. However, the tray must be cleaned well when switching from one type of food to another, since it is often washed with boiling water. A hot water urn which does not come into contact with either meat or dairy remains pareve. One should not pass any liquid food over it when uncovered, as it may drip into the urn. In addition, one should be careful not to pour from it onto dairy or meat foods. A mixer may be used for pareve, dairy and meat. It is preferable to buy a set of beaters for each type of food. Nonetheless, since the beaters are not very hot (yad soledes bo), they may be used for pareve, dairy and meat if they are washed well. One should not use a pareve pastry brush to brush dairy cakes or pastries. A peeler can be used to cut vegetables and there is no reason to have one for dairy, meat or pareve. If one needs a separate peeler for dairy food such as cheese, he should make sure that the peelers look different. The Rama says that the minhag is to have separate salt utensils for meat and for dairy. The reason is that some food particles remain when the food is dipped into the salt, and one may inadvertently mix milk and meat.The poskim say that this halacha applied in the times when salt was placed in open utensils. Today, however, we use saltshakers, and this reason does not apply. Therefore, two separate saltshakers are not necessary. When children are in a household, one should have two separate saltshakers, since they stick the saltshaker into the food. [Ed. Note: If one pours salt from a shaker into a hot meat or dairy food cooking on the fire or just removed, it is best to use the shaker only with that type of food.] Some are careful to always have two separate saltshakers. If one puts salt from a fleishig saltshaker on dairy food or vice versa, (even when there are children in the household) then the food may be eaten. It is best to try to remove the salt from the food. The Rama cautions to drink from separate utensils, since some food particles might get stuck to the utensil. Some poskim mention that one can be lenient with glass since it does not absorb. However, the minhag is to keep two separate sets of glassware. Chicken scissors should not be used to cut pareve food even if they are washed out beforehand. One should have separate dining utensils, such as plates and cutlery. It should be easy to discern one from the other. The custom is to have a separate pareve challah knife to cut challah on Shabbos. It is very common to find cutlery of the other kind in the drawer; one may use the utensil without kashering it first. For footnotes and to see the entire article, click "Buy this issue now" or "Subscribe" at the bottom of this page. I wanted to save money and not pay the double or triple the expense that it would cost to travel with a kosher cruising company. I also did not even want to have those superlative meals that are being offered by the kosher cruising companies because I am on a strict diet. A reheated glatt kosher frozen TV dinner from a national kashrus agency, seemed perfect for me. I had contacted the Norwegian Cruise Line (NCL) booking agents and was assured many times by them that there would be no problem whatsoever in receiving TV dinner type, nationally certified glatt kosher meals prepared by a commercial kitchen that would be kept frozen and served with plastic utensils after re-heating. I booked my trip only after I verified that fact numerous times and received written assurances in confirmation of it. I was horrified to be told the very first night, after we were on the boat and already at sea, that there was trouble with the kosher food and that the boat crew did not expect to have enough kosher food. They told us, even before we said anything, that they will be finding us, kosher, suitable alternatives. Obviously, this was a scene that they had already orchestrated many times, previously. Subsequently, at later meals, the ship's crew absolutely refused to provide the frozen re-heated glatt kosher dinners from the nationally supervised commercial kitchens, that we had ordered. Instead, they started bringing out double wrapped chicken, fish, burgers and frankfurters that they had prepared in their own kitchens. They claimed that it was kosher because the food was wrapped twice around with aluminum foil. I was one of approximately 300 people on board the boat who had ordered the glatt kosher food. Many were pressured by the alternative of having no food for the next three days. They were assured by the multi ethnic crew on the ship that numerous other Orthodox Jewish people were more than happy with the kashrus quality of the fish, chicken, franks and burgers that the ship's crew prepared and wrapped in double wrapped aluminum foil. Many of us were aghast and refused to eat this food. Others did eat it after they were reassured numerous times by the ship's crew that they are familiar with the laws of kashrus and that other Jewish people had been satisfied by the quality of kashrus that the ship offered. They ate the food. The ship's crew was able to produce cases of the raw chickens and of the fish that did have the kosher certifying agencies mark on them. However, the preparation of the food, with unknown other ingredients, in ovens that they had cooked non-kosher food in, using utensils that are used to handle the non-kosher food also, do NOT satisfy the same kosher certifying agency standards that a re-heated frozen dinner prepared in a kashrus agency supervised commercial kitchen affords. People, when pressured with the idea of going hungry on a four day, seven day or longer vacation, do not think reasonably. It is an unfair situation that the cruise ships are placing these people in by refusing to provide the re-heated frozen glatt kosher dinners that are being ordered and promised, when the cruises are booked. The obvious incentive to the cruise company is that it is cheaper for them to buy raw kosher food and kosher chicken, cook it and then represent their own aluminum foil, double wrapped chicken or fish as kosher rather than to order and serve the reheated, frozen dinners from a kosher-supervised and certified commercial kitchen. What makes this even more egregious is the numerous times that I had requested assurance from the cruise line booking agent that there would be no problem with the kosher food that I had ordered and that they would order enough such national kosher-supervised glatt kosher dinners. Despite all the written assurances that I do have in writing, the cruise company decided not to fulfill their commitment. Those of us who desire to travel and vacation on these cruise ships, people who do not need the overflowing, gourmet meals being provided by the kosher cruising companies and/or who do not want to pay the double or triple cost of traveling with a kosher-certified cruise company, have to be aware that some of the cruise ship companies which promise to provide the re-heated glatt kosher frozen dinners can not be relied upon. It is not a commitment that some of these cruise ship companies, such as NCL, at this time, are adhering to. Since my return, I have talked to many other people who have traveled in this manner and they have told me that they had the exact same situation. Many never even realized that they were compromising their kosher standards by eating the double wrapped in aluminum foil, fish and other foods that these cruise ship companies are providing. The general presumption is that once you see food wrapped in aluminum foil twice or three times, that it is kosher. That is a presumption with which most rabbis would NOT agree. While reception is limited to Brooklyn, KASHRUS readers can reach the station via the internet at radiohidabroot.com. You can listen live or listen at your convenience by going to the archives. Press “Recorded”, Press “KASHRUS On The Air” and choose the date of the show you wish to hear. To make it easier, we are listing the shows by date below. You can also listen live on your phone by calling 712-432-4217. And give us your feedback at kashrus@aol.com. The first three programs of “KASHRUS On The Air” were dedicated to preparing for Pesach. On the very first show, March 19, Rabbi Wikler discussed with callers how to prepare the house for Pesach — just what needs cleaning and checking and what does not — and koshering the kitchen. The feedback was extraordinary, and the show was launched. On March 26, “KASHRUS On The Air” featured foods and pharmaceuticals for Pesach with its first guest, Rabbi Nachum Rabinowitz, Rabbinical Coordinator at the “OU” and the man who edited the “OU” Passover Guide. On April 9, the program was dedicated to insects in vegetables and especially romaine lettuce. Our guest was Rabbi Dovid Goldstein, the head of the Kosher Lab at Pos’tiv Produce and the man who supervises the mashgichim and the production of the Pos’tiv vegetables. As it was so close to Pesach, Rabbi Goldstein was our guest long distance from the Pos’tiv plant. He was staying over in Allentown, PA where Pos’tiv has its plant in order to complete the necessary production for Pesach. After Pesach, we began to interview the various rabbonim who certify products in Brooklyn. Our first Rav Hamachshir guest, on April 16, was Rabbi Yisroel P. Gornish who has been giving certification for over 30 years in Flatbush and beyond. Rabbi Gornish is very knowledgeable about shechita and meat, and so some of the conversation was about those issues. Rabbi Gornish mentioned two matters that he hoped that the local rabbonim involved in kashrus would work on together. One was what is already in place in Flatbush, as the pledge has been signed by 19, that rabbonim machshirim will not give certification to an establishment which has been dropped by another hashgacha for kashrus violations. The second matter, one he hopes will be addressed by the local rabbonim, is maintaining fair salaries for mashgichim. On April 23, Rabbi Meir Goldberg, Kashrus Administrator of the Vaad Hakashrus of Flatbush (formerly the Vaad Harabonim of Flatbush), was our guest. Rabbi Goldberg discussed his personal approach to hashgacha, something Rabbi Yosef Wikler kibitzed that it should be called “one strike and you’re out.” Rabbi Goldberg’s policy is a strict one, but no well-meaning entrepreneur need fear. Rabbi Goldberg discussed a difference between what people call “Shomer Shabbos” and what he terms “Shomer Torah Umitzvos.” They mean two very different things. One can close his business and be called a “Shomer Shabbos,” but a “Shomer Torah Umitzvos” means that a person fully practices Torah Judaism. Such a man, he said, can be trusted to supervise the store, even if he is not a mashgiach. A mashgiach, said Rabbi Goldberg, needs to be used for kashrus matters, such as checking vegetables for insects, but a “Shomer Torah Umitzvos” being on the premises can be a safeguard for errors or mix-ups. 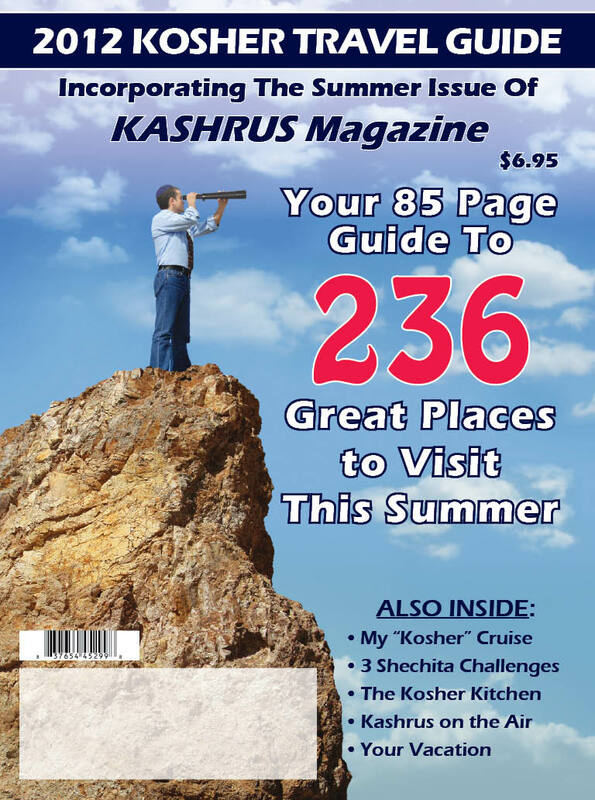 On April 30, Rabbi Avrum Kallus, a former senior inspector for the Kosher Law Enforcement Bureau of New York State, joined “KASHRUS On The Air”. Rabbi Kallus told listeners how he was involved in quarantining the non-kosher chickens that were being sold in Monsey several years ago. He explained to listeners just what the frum world is missing now that New York State’s Kosher Law Enforcement Bureau has been reduced from eleven members to the one remaining person, Rabbi Luzer Weiss, who works without even a secretary, attempting to do the work that the entire staff had once done. The Bureau had responded to requests from the various kashrus agencies to quarantine product that was misbranded, bearing an unauthorized use of their symbol. They had visited our restaurants, caterers and yeshivos. All that basically ended when the state opted to cut out funding for all staff except for Rabbi Weiss. Rabbi Wikler suggested that now all kosher consumers should recommend to the kashrus agencies that, when a product has been found to bear an unauthorized symbol or has been mislabeled as pareve/dairy/meat etc., the kashrus agency involved should issue a letter which they will request the manufacturer to send to every distributor and every distributor to every merchant selling the product. That letter should be posted in each store in which the product had been sold. This would help all kosher consumers. On May 7, Rabbi Moshe Weiner, Rabbinic Administrator of the Kashrus Information Center (KIC) of Flatbush appeared. The KIC visits establishments in Greater Flatbush: restaurants, caterers and bakeries. They ascertain the standards in effect, make recommendations to the rabbonim machshirim, the mashgichim and the store owners and report back to the member rabbonim, of which there are nearly 100. Rabbi Weiner discussed kashrus standards in Flatbush, and recommended that consumers ask three specific questions to ascertain, on some level, the commitment of the owner or mashgiach. Anyone interested in joining or helping the KIC in its work is urged to call Rabbi Weiner at 917-562-2712. As the coats are shoved to the furthermost reaches of the closets and swimming paraphernalia slowly begin inching their way forward, for many that means one thing: Vacation Time! Mere mention of the word is sure to evoke feelings of euphoria in some and feelings of dread in others. While going on vacation can undoubtedly prove to be the highlight of one’s year, there are many logistical difficulties that seem to get in the way. Below I will tackle some of them, offering tips and suggestions for those who have difficulty traveling with children, vacationing on a budget or just the general logistical planning that every trip entails. Involve children in the planning so they’ll feel like it’s their vacation too. Of course, ages and temperament of children will contribute to how much they will be involved, but I think these suggestions can be adapted to almost all children at parents’ discretion. If you don’t have a specific destination in mind, how about giving them a say in the matter? This can range anywhere from allowing them to choose whichever locale or type of recreation they desire, to providing them with two choices and having them vote on it. Timing can make all the difference, especially with young children. Arrange your trip according to their daily schedule – even if this means traveling almost through the night. Have the driver(s) sleep the afternoon of departure, and then the children will sleep in the car. If it is a long drive to your destination and you were not able to leave near the children’s bedtime or naptime, plan to make a stop or two, where the children can run around and have some fun. This way it won’t seem like such an endless trip to them. One of the greatest challenges on family vacations is keeping everyone happy, especially when dealing with a large age range. When planning your vacation, incorporate activities to accommodate the different ages. Of course, the best is to find one trip or activity that everyone will love. If you are having difficulty, opt for a few smaller trips in one day, letting the family know that they will each get their turn to enjoy themselves. As long as they know that their trip is coming, you’ll be surprised at how much fun they can have if they allow themselves. Instead of growling that the playground is so boring, your teenagers, knowing that their big trip is next, may just find themselves having a ball on the swings or with a lively game of tag while they wait. Some trips that are fun for a large range of ages are trails for hiking and biking, zoos and aquariums, amusement parks with kiddy rides, and boating. Have vacations always been part and parcel of your summers since time immemorial? Are you eager to get away and recharge for a bit, but are having a tough year financially and not sure how to swing it? Consider some of these tips for frugal vacationing, taking a vacation without breaking the bank. House swapping has become an increasingly popular alternative to staying at a hotel. This involves finding a family living in your destination of choice who is willing to switch homes with you for the duration of your vacation, whether it is an entire summer, a month, or just a couple of weeks. If that is not feasible, a second option is renting a home from a family in your desired location. Both can be accomplished by taking out classified ads in your desired location’s local publications. Seek out free attractions. Get acquainted with the parks, hiking trails, airports, and historic sites in and around your vacation destination. There are plenty of things to do that don’t cost a penny, or cost very few pennies. Some zoos and museums are free on certain days of the week. Also, try focusing on activities rather than on the actual venue. For example, load up bikes, Frisbees, balls, rollerblades and head to the local park or reservoir. Prepare a scavenger hunt at the mall, or play, “I Spy” in the airport. If you dare, set a budget for the trip and then stick to that budget. While this may sound incredibly stifling, it may actually be more liberating. Instead of just assuming you can’t afford anything and therefore denying yourself everything, setting a budget allows you spend money on some things while cutting back on others. If you’ve managed to find a home to stay in for free, you can go on more expensive trips. If you’re at an expensive hotel, you’ll cut down on the souvenirs, or whatever it takes to keep within your budget. This way, you won’t feel like you’re totally depriving yourselves. There’s room for indulgence without breaking the bank. For the rest of this article, click "Buy this issue now" or "Subscribe" at the bottom of this page. 1. Underground Coffee Company (Christchurch, New Zealand) has been using an “OU” lookalike logo on its products which it registered in New Zealand. The “OU” issued a legal challenge in 2009. The matter has not been settled as yet. In addition, a KASHRUS Magazine reader has reported seeing the very same occurring in ShopRite and Supervalu stores. The bottom line is that kosher consumers must assume that, no matter where found in a store, if the (meat) product has no kosher claim and kosher certification on the (sealed) packaging, it is to be considered not kosher. 3. Some Peppadew Peppers products have been mislabeled. Peppadew International operates in Europe, Amsterdam, and the Netherlands). Products manufactured by Peppadew International in South Africa, bearing the “OU” symbol, are certified kosher by the Orthodox Union. Products distributed by Peppadew International Europe BV (PI Europe) are NOT certified by the Orthodox Union. Some Peppadew International Europe products (including Peppers Stuffed with Cheese), primarily sold in the Netherlands, mistakenly bear the “OU” symbol. Corrective measures are being implemented. 4. Coupons being distributed for the Cold Rush Frozen Yogurt Store in the Richfield Shopping Center (Clifton N.J.) bear an unauthorized “OU” symbol. These coupons were distributed in the Passaic-Clifton area. The Orthodox Union does not certify Cold Rush and has no information about the kosher status of that store. 5. Ben-David Winery (Moshav Sdei Eliezer) used an unauthorized "OK" symbol on bottles of Merlot 2008 (a dry red wine). The label states “OK-P” (Kosher for Passover), but, in actuality, the wine has a regular non-mehadrin supervision and is the product of heter mechira grapes. Kosher wines produced in Israel in 2008 may be shemita wines and subject to the laws of kedushas sheviis and treated accordingly (i.e. none of the wine can be discarded). However, some wines produced in Israel in 2008 were produced from non-shemita grapes. Readers can trust those kashrus agencies known to them, that kedushas sheviis was avoided or was noted on the bottle. Consult your rabbi for more guidance. 6. Endomune Advanced Probiotic Capsules (Medical Care Innovations, San Antonio, TX), bear an unauthorized “OU” symbol. This product is not certified by the Orthodox Union. Corrective measures have been implemented. 7. Saratoga Chips For Goodness Shakes Seasonings (Saratoga Specialties Company, Saratoga Springs, NY) bears an unauthorized “OK” symbol on the label. 8. Products distributed by G & S Bakery (may be under the name G&D) bear an unauthorized VHQ. Corrective measures are being taken. 9. My Choice Frozen Yogurt and Juice store (845 7th Avenue, New York, NY) printed brochures that display the “OU” symbol. This store is not certified by the Orthodox Union. 10. Uncle Ben’s Whole Grain and Wild Rice: Mushroom Recipe (Mars Food US LLC, Rancho Domingues, CA) mistakenly bears an “OU” symbol and contains a spice packet that is not certified by the Orthodox Union. Corrective measures were implemented. For the remaining 56 Consumer Alerts in this issue, click "Buy this issue now" or "Subscribe" at the bottom of this page. For a complete list, or for the full Guide, click "Buy this issue now" or "Subscribe" at the bottom of this page.